The first main line diesel-electrics to be built in large numbers were the 200 locomotives of English Electric Type 4 introduced in 1958. English Electric was perhaps the true begetter of diesel traction in this country, and the 2000hp engine fitted to the Type 4s was developed from its pioneering work on the two LMSR prototype Nos 10000 and 10001. The Type 4s probably did more to bump steam off main line duties than any other diesel but in truth they were sometimes scarcely the equal of the most powerful locomotives they replaced. The first 10 to be delivered were divided between the Great Eastern and Great Northern lines of the Eastern Region (pre-grouping titles were all the go at that time), and eventually all Regions except the Southern and the Western got some. The second batch to be built went to the London Midland Region, and here a gleaming new No. 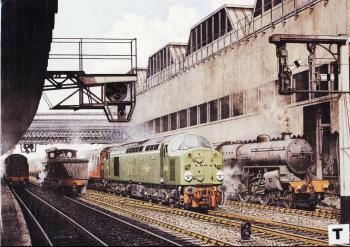 D225 whistles smugly along between Manchester's Exchange and Victoria stations with a trans-Pennine express. The LMR later named many of its Type 4s after famous passenger liners to mark their use on the Liverpool Boat Trains - a simple fact that now seems to place them firmly in another age. No. D225 became Lusitania, not a particularly happy choice in view of the fate of that magnificent vessel, but not as embarrassing as sister No. D222 which was named Laconia after a contemporary cruise ship which then promptly caught fire and sank. No. D225 is a diesel rose among steam age thorns which are (left to right): an LMSR 2-6-4T; an elderly Lancashire & Yorkshire 0-6-0 goods engine perilously near the end of its life and being used to bank trains up the grade to Miles Platting; and an LMSR freight locomotive of the type nicknamed 'Crabs' from their ungainly appearance. Visible on the far left is part of Manchester Exchange station's platform 11 which actually connected it with Victoria and was for many years the longest platform on BR. After electrification and the introduction of more powerful diesels had displaced the Class 40s - as they were re-designated - from their front rank duties in the 1970s they found useful work on semi-fast, cross-country and freight trains for another decade. They became much loved by a post-steam generation of enthusiasts who nicknamed them 'whistlers' on account of their distinctive engine sound and several have been preserved. The only one left on BR is No. D200 (40122), the original locomotive, which is retained in service restored to its old green livery for working special trains.